How to Make The Perfect Hardboiled Eggs isn't rocket science, but it can be difficult. Check out our foolproof method to getting them right every time. In a large heavy bottomed sauce pot, fill with water half way up the pot. Turn on medium high heat. After 3 minutes (BEFORE water starts boiling), add eggs you are cooking. Eggs should be just barely covered completely with water. *Tip: Use a pasta fork to carefully put eggs into hot water without burning yourself. Once water comes to a boil, set a timer for 10 minutes. Immediately once timer goes off, turn off heat and drain the water. Add cold water to your pan. Drain. Repeat until water covering eggs is no longer hot and eggs can be picked up without burning. 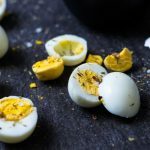 Carefully crack the shells and remove them from the hardboiled eggs. Rinse eggs to remove any small remaining shell pieces. Add optional herbed salt or use as desired. Nutritional facts do not include optional herbed salt.